Looking for some Sailor Moon-themed threads? There's a new Sailor Moon-themed clothing store in Tokyo. But, you better act fast before it's gone. 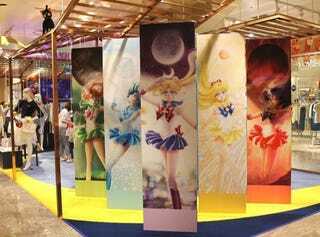 As announced by the Isetan department store in Shinjuku, the name of the shop is, ahem, Girls Love Mode: Let's Prism Power Make Up. The boutique features original Sailor Moon-style outfits from fashion brands Honey Bunch, Secret Honey, and Riccimie Premiere Salon. For example, Riccimie, which is known for its frilly outfits, did the Princess Serenity gown. Seems like a good place to pick out outfits to go with that Sailor Moon lingerie, no? If you are interested in visiting the Sailor Moon clothing boutique, you need to hurry as Japanese site Pouch reports that this shop will be open only for a limited time, from April 1 to April 8.